Find phlebotomy training classes in Rhode Island below! Can't find a school near you? Try our advanced search powered by Campus Explorer! Rhode Island has few schools that offer course and training programs for phlebotomy and one of them is the Cranston Adult Education Programs. This training institution offers a five-month phlebotomy program which is comprised mainly of theory and classroom instruction. The classroom instruction will teach the students the basics in blood sampling procedures, physiology, and anatomy. Moreover, they also have to complete recommended supervised clinical training for 100 hours. Keep in mind, if you haven't completed Medical Terminology you need to register for a pre-requisite to be admitted in the program. Enrollment for the program is a first come, first serve basis but students can register online as long as they have the necessary requirements. The cost of the program is $1,050 not inclusive of books and other fees. Students can also take the national testing as soon as they complete the course so that they can start looking for employment in different settings in the medical field. Become a certified phlebotomist and get your training from Bastien Academy. Situated at 120 Amaral Street in Rhode Island, this educational institution offers a variety of short-term medical courses thus making it a premier institution in Rhode Island. The entire phlebotomy program takes 80 to 90 hours to complete. Students also follow a convenient schedule since you can choose between classes held on either weekdays or the weekends. Also, students need to complete clinical training within the in-house clinical facility in the Bastien Academy where students learn how to follow protocols for collecting blood samples. Students do not need to go far just to get their clinical training. The Bastien Academy has been producing qualified phlebotomist in Rhode Island since 2008 thus if you want to graduate from the best school, now is the time to enroll. Phlebotomists are healthcare professionals that draw blood from patients as well as donors in clinic-related facilities. An individual aspiring to become one needs to study intensively to learn the many techniques in phlebotomy. In Rhode Island, one of the schools that offer an intensive program in phlebotomy training is the Community College of Rhode Island. The school offers phlebotomy as a two-semester program. Students can choose the evening program and day program given during the fall and spring semesters. Under the program, students not only learn the proper techniques on drawing samples but they also learn how to deal with patients and work with other healthcare professionals. The program provides classroom, laboratory, and clinical instructions so that students are provided with the experience that they need in order to become qualified phlebotomists. Once they complete the program, they are now eligible to take the national certification exam offered by the American Society of Clinical Pathologists. The 911 Programs Phlebotomy Training program is open to all individuals who are 18 years of age and above. Applicants should also have at least an 8th grade reading and writing level. To cater to working individuals, the school provides both day and night programs. Classes at 911 Programs are held on weekdays for 6 weeks followed by a 40 hour per week clinical rotation. Students need to complete all the immunization requirements before they can start with their supervised clinical practicum. The 911 Programs offer the certified phlebotomy training program within one semester and the tuition fee is between $2,500 and $3,000 depending on the training course. 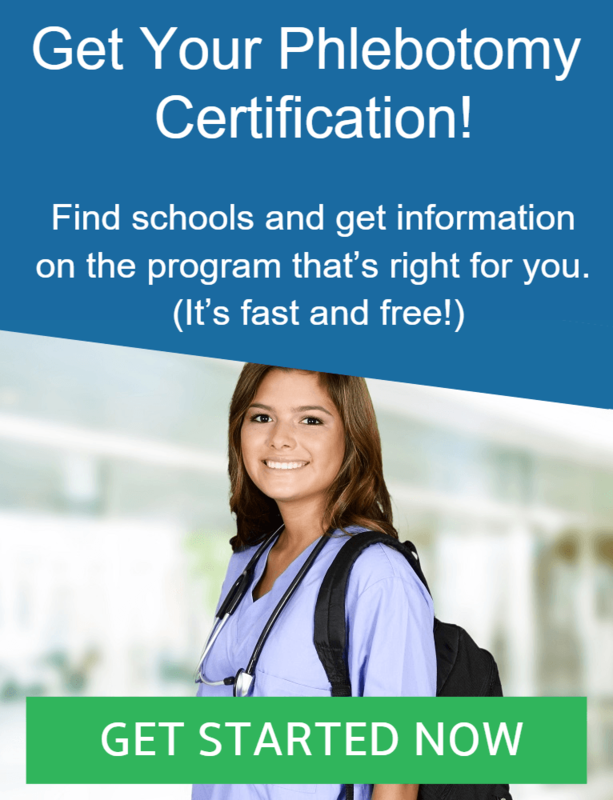 Once the student completes the course, he or she is eligible to take the national certification exam to become a full-fledged phlebotomist technician.